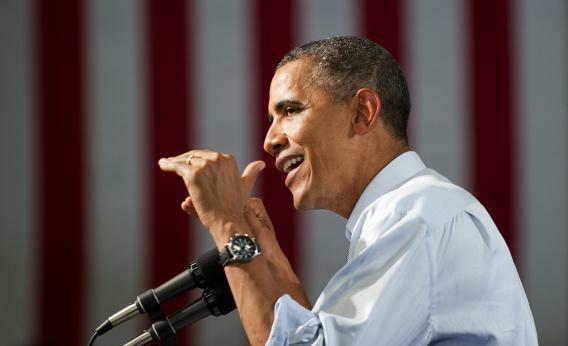 US President Barack Obama delivers remarks during a campaign event at Grand Junction High School in Grand Junction, Colorado, August 8, 2012. I have never met anyone who thinks the American economy’s performance over the past 18 months has been particularly impressive. There’s no rip-roaring job growth here. But I noted yesterday that if Obama gets re-elected and the current trend continues, he’ll rocket from last place to average in the job creation league tables. Couple that with the fact that his predecessor will be last and the job creation list, the passage of the Affordable Care Act, the end of the wars in Iraq and Afghanistan, and the death of Osama bin Laden and suddenly Obama’s a Great Man of American History. Conversely, if Obama loses he’ll go down as a miserable failure who oversaw the worst economic performance since Herbert Hoover. What’s more, by the exact same math I applied above the Romney job creation record will look pretty damn good even if we don’t see any speedup of growth whatsoever. At 150,000 jobs per month, Obama is still having trouble paying down the “unemployment debt” that we wracked up in 2009. But give him a second term and it’ll be done easily. Let Romney take over without that debt, and the sky’s all clear. Which is just to say that while the substantive stakes of every election are high, the dramatic nature of the economic collapse in 2008 and 2009 means that the reputational stakes on the ballot in 2012 are unusually high. Lose and Obama’s an even bigger failure than Jimmy Carter. Win and he’s the most successful Democrat since FDR. And largely all by a quirk in the jobs math.